Do you remember the Sunscreen Song? My entire life I have been an outdoor enthusiast. I grew up at the pool swimming everyday. I was there from the time it opened until it close. Thirty years ago we did not have the informationl resources we have now. I hardly ever wore sunscreen. I have blonde hair and blue eyes. I heard about skin cancer but I never thought it would happen to me. I was so very wrong! Two years a go I noticed a "spot" on my leg that just didn't look right. First, I went to Dr. Jon and ask him to remove it. I wish taken a photo before we removed it. So many people have asked what it looked like. Not to be gross but it was pea size, white, brown and just would not heal. He removed it and I really didn't think much about it. Then he called while I was driving the kids to school. I remember the conversation. Dr. Jon: Can you talk? Me: Sure, I'm just driving the kids to school. Dr. Jon: Ok, can you call me when you get home? I knew it was not good. We talked when I got home. He informed me that I had Malignant Melanoma. This was the start of the journey. If you stop reading...please watch this video! He made me an appointment with a surgeon that day, which was a Thursday. They wanted to do surgery on Friday but I had planned to go to Texas to see my mom that weekend. Everyone agreed that I should go see my mom and we would have the surgery when I returned. I didn't post anything on facebook about the melanoma until this post. I have this big huge brace on my leg not because I fell, or had my knee scoped or anything running injury related. I have melanoma! Not good and very scary. I would have just kept this to myself but this brace prevents me hiding it. Two weeks ago Dr. Jon removed a spot from my shin area. He sowed it up nicely with 9 stitches. Unfortunately, the pathology was bad. So, today they removed more ...from the area. The incision is large and required a skin graph from my quad. Then the removed the lymph node to see if the cancer has spread any further. Now we wait! Please pray the the results are negative and we can move on! On a side note: if anyone can help Dink with Mt Mist please message him. I'm out of commission for a few days! The days that followed were tough. They removed a very large section of my leg. It was VERY deep. The first time they remove the bandages I just cried. They took a skin graph from my thigh which was supposed to help it heal. The graph did not take. It took almost 6 months for the spot to close up. I do have some photos but I have been advised to most post them. This was disguising. I was very embarrassed and self conscious about it for over a year. I am just now conformable with the scars on my leg. For the following year I went to Vanderbilt to explore treatments. I went to the Cancer Center every 3 months for scans. I go to the dermatogist every 3 months. I know what to look for but if anything looks different I still get it checked. I trained for Ironman the last 2 summers. I wear sunscreen. I reapply sunscreen often. I try not to train in the heat of the day in the high sun. I still vacation at the beach but I have to stay covered. I have not been sun burned since then. I have had other spots that have been of concern but nothing major. I am sharing this only to remind you to protect yourself. As athletes we are outside a lot. Have a great Spring Break but WEAR SUNSCREEN! This website is a great resource for things to check! If melanoma is recognized and treated early, it is almost always curable, but if it is not, the cancer can advance and spread to other parts of the body, where it becomes hard to treat and can be fatal. 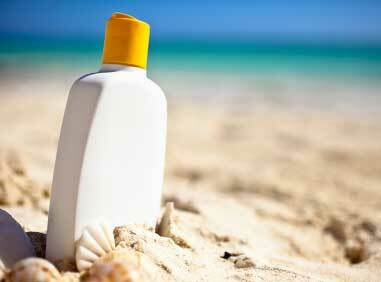 While it is not the most common of the skin cancers, it causes the most deaths. In 2016, an estimated 76,380 of these will be invasive melanomas, with about 46,870 in males and 29,510 in women.